Yup, its now officially (but unofficially) summer and that means 2 things, well 3 things. First, we eat corn. Secondly, It’s hot out, and get so hot in our little tiny loft that having the oven on is like torture so I avoid it at all costs. And lastly, I seem to always have less time(or forget) to make dinner cause, you know, I am outside running around with my head cut off. The solution to the last two…..Quesadillas. I probably make the mister quesadillas at least 5 time a week. They are just so easy to make (takes about 8 minutes) are full of some kind of veggie situation and lots of cheese (which is the misters favorite food group). You can make one, for a quick lunch, or very easily make 10 to feed a few people for a easy dinner. (everyone likes a quesadilla!). And even though I cooked these particular ones inside, quesadillas are great made outside on the grill. They just make so much sense. 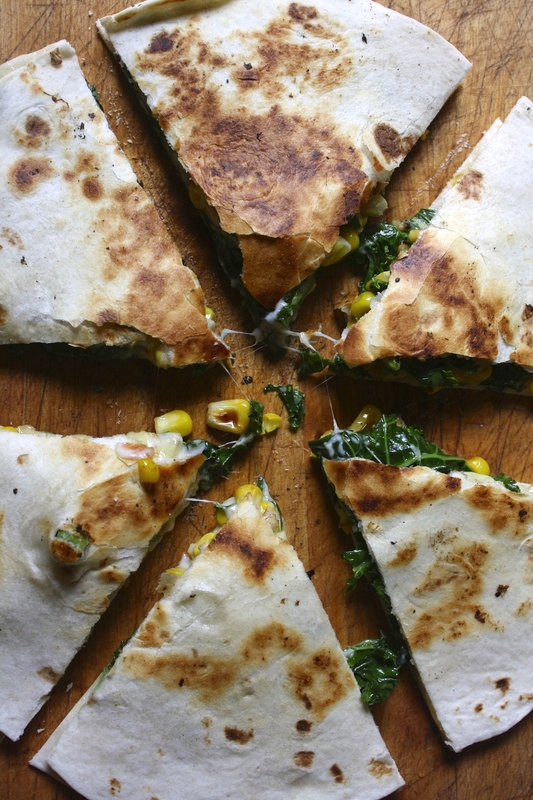 Summertime + corn = Charred corn and kale quesadillas. While you are cutting the corn, preheat a large pan on medium high heat. Once the pan is hot, toss the corn kernels right on into it and sprinkle with salt and pepper Let cook for a minutes or two, then give it a stir and cook for another minute. After about 4 minutes the corn turns bright yellow and starts to char. Remove pan from heat and toss in the chopped up kale. And compile the quesadilla. Tortilla, grated cheese, corn and kale, more cheese if you please, and top with anther tortilla. Place assembled quesadilla into the pan and place on medium heat. Cook both sides until brown and cheese is ooey gooey. Serve right away. Can be eaten on a napkin, plate, or directly off the counter. Not needed, but it would be nice of you to serve with a little avocado, salsa, or sour cream. Preheat a large pan on medium high. While the pan is heating up, cut the corn from the cob. Once pan is hot, toss corn kernels into hot skillet and sprinkle with a pinch of salt and pepper. Give corn a stir after a few minutes. Once the kernels start to turn bright yellow and get a little charred, remove pan from heat. Chop up kale into little pieces and toss into pan with the corn while the pan is still hot. Mix around and let the kale wilt a bit from the residual heat. Ready your tortilla. Place half the cheese onto totilla, add on half of the corn and kale mixture, sprinkle with a bit more cheese and top with another tortilla. Place onto now empty pan and heat up quesadilla until brown on both sides and chesse is melty. Remove from skillet and cut into triangle. Repeat for the second quesadilla. Serve right away with or without some guacamole, salsa, or sour cream.